Even though “Defiance” is in the town name, there is one thing that the residents of Fort Defiance shouldn’t be defiant about: tree care. From tree removals and stump grinding so that diseases don’t spread to storm damage cleanup and pruning, Staunton Tree Service serves a wide variety of tree related needs. Fort Defiance is a gorgeous place to live, and with the best tree care available to you, you are going to make it just a little more gorgeous. Give us a call and we can set up an appointment for you or just walk you through some of our other services. 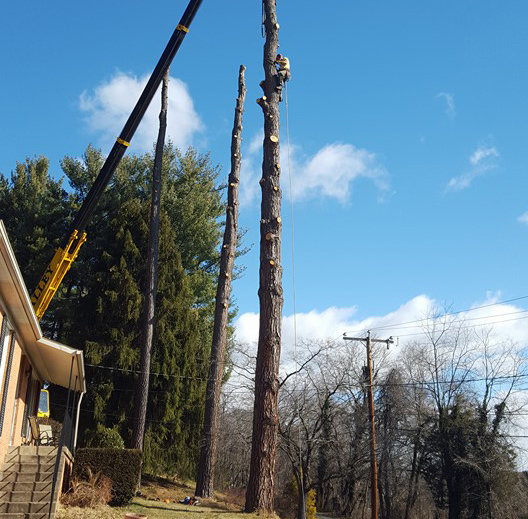 Use the form below to request a free estimate on your tree service needs in Fort Defiance, VA.
Tree removal in Fort Defiance is a fairly common activity. However, tree removal shouldn’t be something that you do on your own. Professionals have to look over your yard and see the best possible place to let the tree fall. If your yard is small, special equipment may be needed to fix the problem. From there, everything needs to come down easily and safety – requiring a lot of different tools. It is really too much for people who don’t have a background in the skill, so make sure you hire professionals who have a great deal of experience. Staunton Tree Service offers all of that along with the insurances that keep you (and us) safe. Getting your trees trimmed and pruned is all part of owning a tree. Not only does it make them look better, it also makes them healthier, prevents breaks, produces more shade and fruit, and helps with winterizing. Tree trimming and pruning is a very precise art that requires a skilled hand and high quality tools. With Staunton Tree Service, you won’t have to worry about purchasing them – just give us a call, and we will get to work as soon as we can. Once you have a tree cut down (or it falls), you are left with an ugly, potentially dangerous stump. Stumps leftover from trees that died probably still have the disease or infestation that made it sick in the first place. And if not, it is a great environment for something to live. Stump grinding is an easy fix for a potentially large problem, so don’t delay the phone call to us. Your trees should lead long lives, but they won’t do that if they aren’t kept healthy. It has been proven that trees that are healthy cost less, have fewer problems, and look better than those that are just left go. Even a quick examination can work in your favor. Our certified arborists look over your tree from root to tip to search for anything problematic. If we find anything, then we work with you to fix the problem. We can also stop problems from developing. Give us a call today and we will have someone on your property soon. Fort Defiance can see the brunt of a lot of storms, which means that there can be quite a bit of damage to your trees and property. Sometimes doing the cleanup can be dangerous. At Staunton, we have the equipment to make it really easy to clean up after any storm. Give us a call and we will get our fleet out to help you get back to normal. Fort Defiance is a smaller town, but that doesn’t mean you don’t expect the best. Staunton Tree Service provides you with high quality service with low, economical price tags. If you need something done to your trees, chances are that we can help you out. Give us a call today.